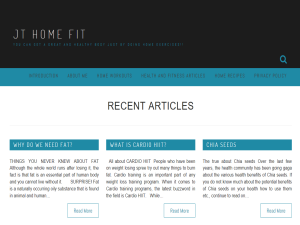 Blog Description: JT Home Fit is web page created to show the people that just by doing one hour or less a day of home exercises you can have a great and healthy body. That you don't have to go to the gym 24/7, neither to do extreme diets. Just with a small but efficient weight's equipment, cardiovascular tools and good flexible diet you can do significant changes in your body from your home.